Knitting while the weather is warming up seems a bit silly, but I do love my cotton sweaters. And I absolutely adore A Stitch in Time. Wouldn’t it be fun to knit and crochet my way through the entire collection? Now that there are two volumes, it would probably take the rest of my life, but it just might be worth the effort. And I am not sure I would ever get any use out of a knitted swimsuit, but you never know . . .
For me, the scariest part of knitting sweaters is that it takes hour upon hour, and there is no real way of knowing if all that work is going to turn out to be wearable. If the darn thing does not fit properly, there is not a whole lot to be done. There is no trimming down of seam allowances with a knit sweater. This is "Such a Debonair Little Jumper." Even the names are more interesting with vintage patterns. I cannot for the life of me read lace patterns when they are typed out. I need a diagram with symbols or I inevitably lose my place and get extremely frustrated. To save a lot of tears, I have started making my own diagrams – and it works brilliantly. My yarn choice this time around was a bit too thick for the pattern, so instead of ending up with negative ease, it is on the large side. And the sleeves ended up being a bit longer than I would like. I may try my hand at shrinking the cotton, or I may chicken out and leave it as-is. The skirt was another attempt to make more wearable items for my wardrobe. That is not to say I am going to stop making my fancy frocks. But on those lazy days, it is nice to have an easy fitting skirt to throw on. 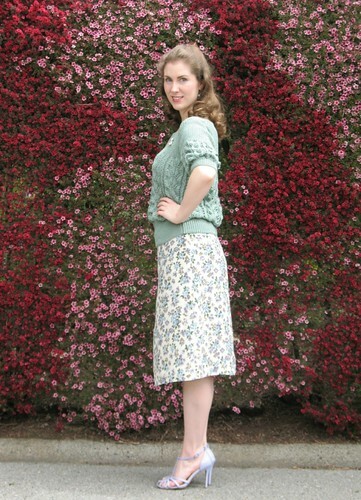 I already made this particular skirt in wool using Vogue 2885, and decided that this floral fabric (another fantastic grab from the Sew Weekly Swap) would be perfect for a summer version. I am unsure of the fabric content. It is one of those mystery fibers and I cannot decide what the heck it is made of. I was worried that it was polyester, but after wearing it all day, with no static cling whatsoever, I think it must be some sort of rayon/acetate blend?! I may never know what it is made of, but I can say that it is yet another successful garment made from swapped materials. How fun is that?! So pretty! I just love seeing your knitted creations as well as the sewing!! You make such pretty things! I love this sweater, it looks great and I like the band at the bottom. So nice!! 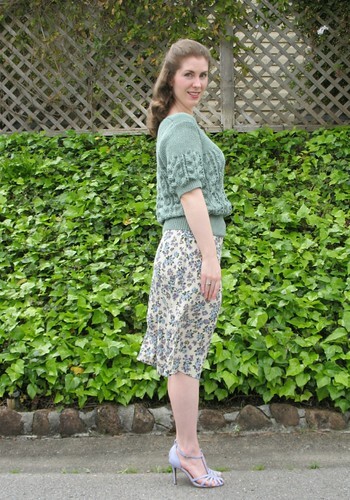 That soft sage-jade shade is so sweetly lovely - as is your whole outfit. 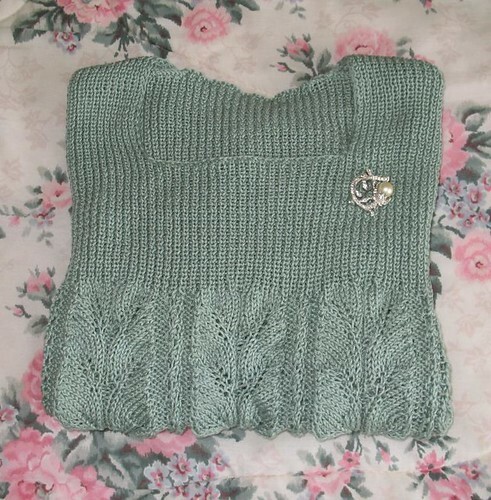 Wonderful work on this sweater, it's such a charming gem. I have noticed recently sweaters that are knit from the neck down on circular needles. The increases are worked in, and once you reach the shoulders, you can theoretically slip the stitches onto spare yarn and try the sweater on to check the fit. 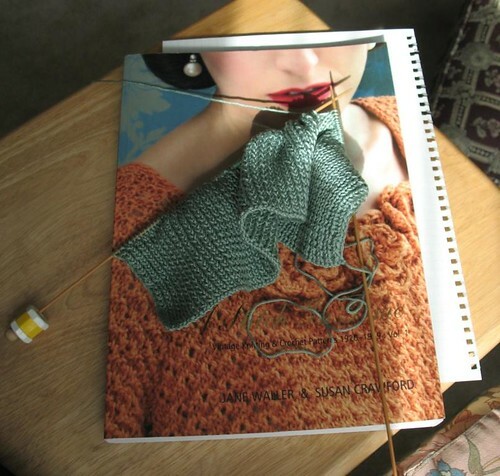 It sounds like a marvellous idea and I have a pattern I am going to try this on, next in my queue of things to knit. I found the technique described well in this video. There are 7 videos and I did watch them all, I found it fascinating. I have noticed many sweaters that I love on Ravely are knitted with this method. I have just about finished this jumper and mine seems to be a bit big too, serves me right for not knitting a tension square. I love the colour you have chosen. I am having a dilemma with mine, do you ever knit something and get most of the way through and wished you had chosen another colour? I think the jumper still looks great even if it is bigger than that in the book. I think after staring at the same yarn for months on end, one is bound to get a little tired of it, no matter how beautiful the color. My major problem is knitting something, only to find I have nothing to match back to my new sweater. Really silly, right?! Lovely! 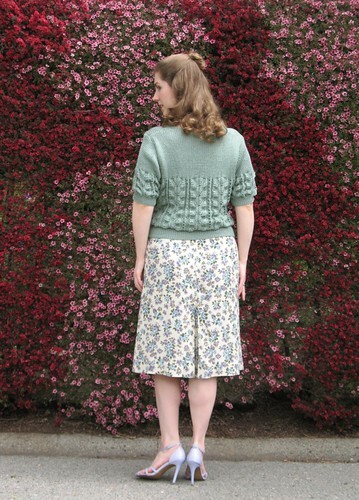 The sweater and the skirt are beautiful together. 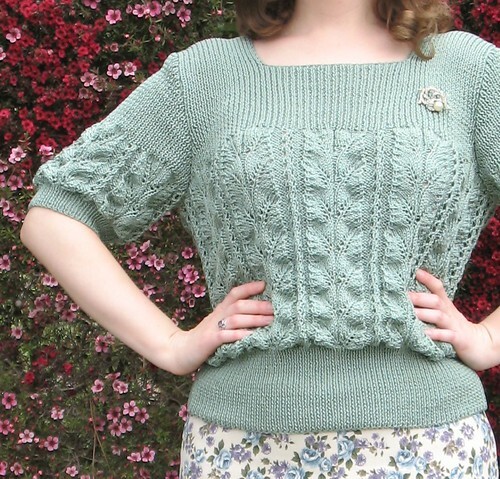 I'd love to get around to knitting a full sweater one day, but I love looking at all of the creations out there. I'm sorry, but who would spend months knitting a sweater, but not first spend two days experimenting with generous tension squares in order to check/adjust the gauge?? (Lizzie! Please.) To me, that simply makes no sense. I could never enjoy making the sweater if I didn't feel confident about the tension/needle size/gauge/fit. WTF, ladies. I did knit a tension square, but it can be hard to tell what the fit will be like until the entire sweater is finished. And at that point, it is usually too late to go back. I like the way the sweater fits, it looks just right. I have been reading the reviews on Amazon for the stitch in time books and it is mainly people saying the patterns are full of mistakes. Have you found this? I would love to use the books but not sure if I would spot or be able to rectify any mistakes. So I would say, go for it! Thank you, These will be going onto my wish list. Thank you , these will be going onto my wish list.